Desktop sticky notes (post-it) program, that allows you to keep desktop sticky notes and also send them across the network to others. 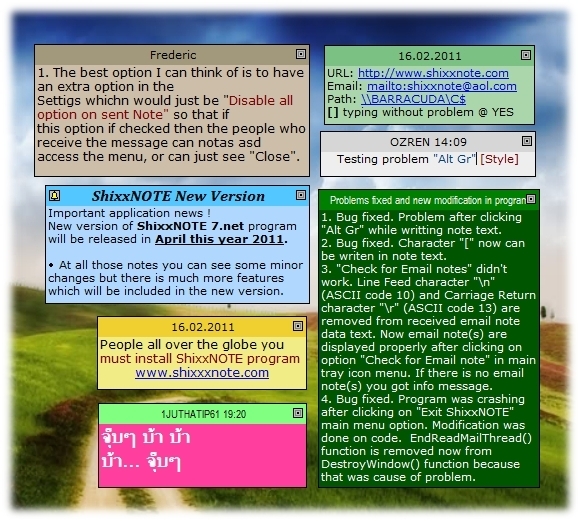 ShixxNote is a network enabled sticky (post-it) notes program. The program runs in client/server mode and transmits messages or notes to selected ShixxNote clients on the network. You can also send messages to machines that do not have ShixxNote installed, in which case the program will automatically use the standard Windows Messenger service to deliver the message. In ShixxNote creating a note is a matter of making a double click on the program icon in the system tray. Once created, a note is displayed on your desktop and can be instantly shared over LAN, the Internet or email with all the interested parties. You can share notes with specific recipients or groups of users, save, print, export and import notes, set alarms and expiration dates, save notes to files and fully customize their appearance to match your desktop theme. It is multi thread client/server network tool that lets you display notes on your desktop and send them through your local network (LAN), Internet or via email to others. Easy to use personal info management application and powerful communication tool. It makes writing notes to your self or to your colleagues very easy and instant. The sticky notes appear "stuck" on your desktop, and it is pretty hard to forget something that is written on them. It is configurable and stable. All computer users which work in a small or middle office. Where they have all computer integrated in a Local Area Network. This user can be working in some dentist office, or can be some student on University. Scan and Sort it is affordable professional archiving software to create and maintain a digital archive. Search lightning fast in thousands of documents using a phrase or a single word. This is our 10th anniversary freeware version! Easy-to-use automatic telephone and text notification software with confirmation and built in calendar. Ideal for time sensitive customer based organizations and professional offices. Create personal reminder messages with the text to speech feature. RegCell is Microsoft Excel plugin that automates an import of regular-structured notifications, such as payments, orders, billing and technical reports, news etc., that you usually receive by email from mail robots. Simply drag and drop your powerpoint presentation file and then press the Write CD Now button and you are done. AutoPlay me for PowerPoint does all the work. Not only does it add your file it also adds the latest PowerPoint 2003 Viewer. PPT to PDF Converter is a PowerPoint Plugin that convert PPT to PDF, PowerPoint document to PDF automatically. Split, Merge and Secure PDF Files. PDF Junction provides a set of processing tools for PDF files, including splitting, merging, setting of security, and generation of XML metadata files. The product has both a GUI and command-line interface. This site does not contain serial number, crack, keygen ShixxNOTE serial number : serial number is the simplest type of crack. A serial number(cdkey,product key,etc) is register the program as you may already know. a crack or keygen may contain harmful software. If you cannot find the exact version you want, just give it a try. for more information read .nfo/.txt/.diz file include in zipped file.